If you're a runner, you might know me. 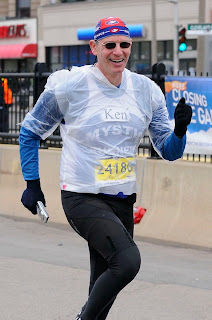 I'm the guy you see each week in a local 5K...or a near-vertical Mountain Race...or maybe running alongside you with a big smile in the Boston Marathon. I'm not the fastest guy in the race (not by a long shot! )...but people tend to notice me. Maybe it's because I've got a camera in my hand. Nope. I'm running with a camera in my hand. Runners love photographers. We might be running strong or we might be doing the Survival Shuffle, but when we see a photographer by the side of the road we all brighten up, run tall, and break into a little sprint. We want to Look Good! See? We're Running Strong! We flash the photographer a big smile or a "V" for Victory or throw both arms up in the air. Yeah! We're running! Take the picture! Take it NOW! While we're running strong. After we pass the photographer we drop right back into whatever we were in before we noticed him. If it was the Survival Shuffle then we're back in the Survival Shuffle again. Gotta hang on till the finish line. But we hope he snapped a photo of us while we were Running Strong. A photographer by the side of the road can never capture the experience of being IN a race. They're by the Side of the Road! Outside of the flow of our race experience. They're not sucking wind. Not flying past the scenery. They're outside. We're Inside. They're sitting down. We're RUNNING! We're kinetic. Here and gone. How can a rock see what a bird sees? How a camera in one place capture the flow of scenery and faces that we experience in any race? So I've decided to become a new kind of photographer. Not a guy sitting by the side of the road with a Long-Lens SLR. I'm running right next to you. I'm wearing a race number and sweating and panting with you and every other runner in this race. Like you, I love to run. And like the photographers by the side of the road, I love to capture the beauty of this experience in pictures. But unlike those photographers, I snap my photos from INSIDE the stream. I capture a "Runners-eye" view. You've probably seen me. One race or another. But even if you've never pinned on a race number, welcome to my blog. Now...without even lacing up your running shoes, you can Run With Ken. Each week I'll bring you along as I run a race. We'll do seaside races where the wind blows off the ocean and you can taste the salt. We'll do mountain runs when you climb and climb until you gaze DOWN on the clouds. And we'll do fun little 5Ks where you run with a bunch of happy people and then line up for the post-race food and beer and we'll all pretend we didn't notice the time on the finish line clock. I love to run. And I want to thank you for running with me.